I was granted some hands-on time with the Pentax K-01 in Las Vegas and the camera was definitely a study in unconventionality. The K-01 looked as though it were one part MoMA exhibit, one part toy camera and two parts Ikea. The camera was large and boxy, yet comfortable to hold and steady. What really blew me away was the new 40mm F2.8 prime lens mounted to the camera with its super slim 0.35-inch thin profile that rivaled the thickness of its lens cap. Although Pentax opted for a mirrorless design, the company still equipped the K-01 with a popup flash, and the camera was stocked with a modest set of external controls that included a rear-mounted control dial and four-way directional pad. The Pentax K-01 will be the choice camera for hipsters looking to make a splash in Photography school, but I’m also seeing this Willy Wonka camera fall into the hands of eccentric artists, photography collectors and Pentax diehards. The K-01 will be available in yellow, black and white in March 2012 for $749.95 (body only) and $899.95 (lens kit including new DA 40mm XS) in Marc Newson designed packaging and with the Marc Newson designed strap. The smc PENTAX-DA 40mm F2.8 XS unifocal interchangeable standard lens will ship at the same time for $249.95 USD. 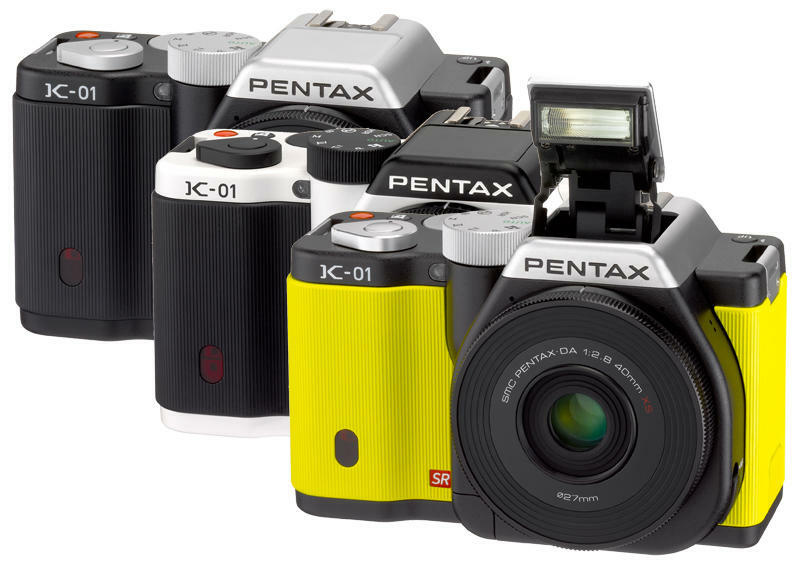 The K-01 will also be compatible with every Pentax K-mount lens ever made. Stereo microphone with audio gain and wind noise suppression. Flexible ISO range of 100-25,600 ensures gorgeous noise-free imaging in any lighting condition. Next-generation High Dynamic Range (HDR) mode. 19 Custom Image Modes and Digital Filters like Bleach Bypass and Miniature. Contrast-detection autofocus system with 81 selectable focus points. K-01 including the product logo, camera strap (included) and start-up screen that appears when the K-01 is powered on. 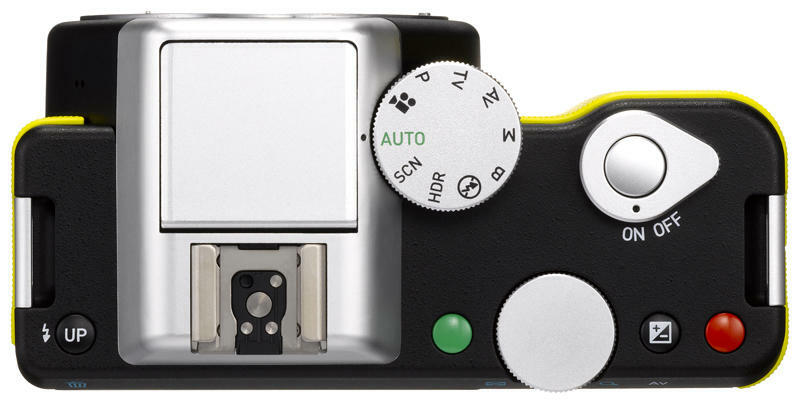 Buttons, shutter release and control levers are purposefully placed and accented with colors for instant recognition including a vibrant red button for Video Recording and a brilliant green for the PENTAX Green button. The mode dial and power switch are made of high-quality aluminum alloy, while the memory card slot and grip connectors are covered with protective rubber. The design optimizes both form and function on a camera that is as suitable on a photo shoot as it is in a museum display that honors design as art. 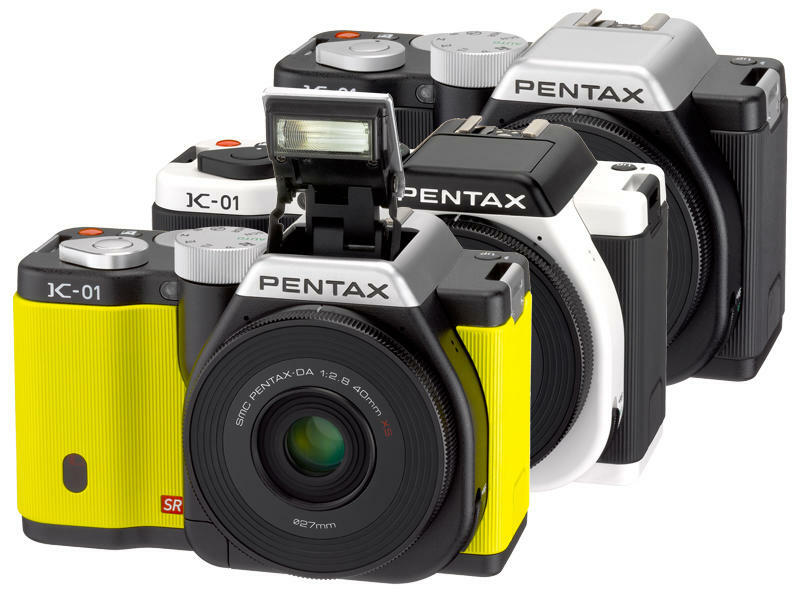 The PENTAX K-01 is equipped with a newly developed CMOS image sensor measuring 23.7 millimeters by 15.7 millimeters. With approximately 16.28 effective megapixels, this sensor assures high-speed readout of image data signals. The K-01 also features a new “PRIME M” imaging engine to assure first-rate movie recording performance in a digital interchangeable lens camera. The K-01 offers an extra-wide sensitivity range — from ISO 100 to ISO 12800, or to ISO 25600 when expanded using a custom function — while minimizing digital noise at all sensitivity levels. The PENTAX K-01 accepts a wide array of PENTAX interchangeable K-mount lenses* so users may choose the most suitable lens for a particular subject or scene. Video record options are flexible, offering the photographer to select aperture or shutter exposure control, and PENTAX Shake Reduction helps stabilize captured video. Users may add personal touches to recorded clips using various Custom Image modes or record subjects in a series of video clips with the Interval Movie Shooting mode. 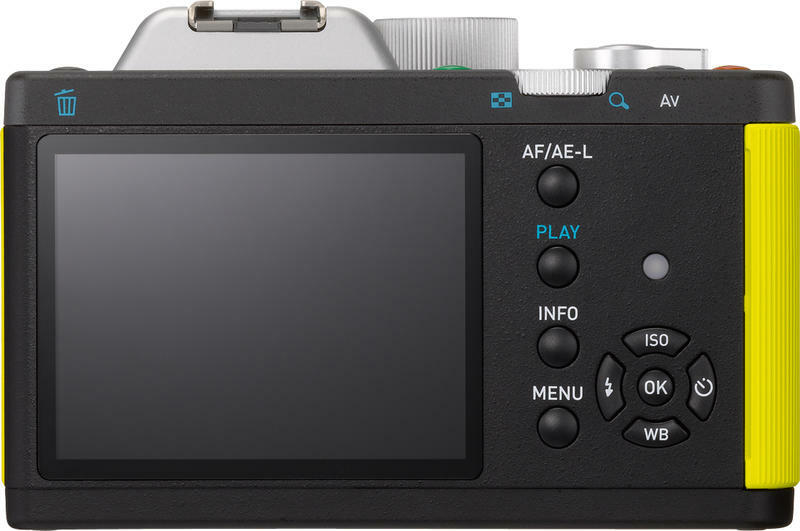 The PENTAX K-01 also comes with an HDMI terminal (which allows the user to simultaneously output both Full HD movie clips and stereo sound) as well as an external microphone input terminal. The High Dynamic Range mode (which produces one extra-wide-gamut blended photo from three images taken at different exposure levels) is accessible with a turn of the mode dial and allows users to select one of three exposure increments as well as the level of effect, while an automatic position adjustment function assures precise alignment of three images even when they are taken with a handheld K-01. The PENTAX K-01’s Custom Image modes allow users to select the most appropriate finishing touch for a particular subject or scene to express the photographer’s creative intention or taste. Two of the 11 Custom Images functions are Bleach Bypass to create a dramatic visual effect used in motion pictures and Cross Process to produce a fanciful image with unusual colors. The K-01 also features 19 distinctive digital filters including Miniature to convert an actual scene into an image full of miniature models for an unusual visual effect. Users may be more creative by applying multiple digital filters to a single image. The PENTAX K-01’s high-speed burst shooting mode comes in handy when preserving the action of fast-moving subjects in a series of images, since it captures up to six frames per second. With its mirrorless construction, the K-01 offers exceptionally silent mechanical operation that allows users to concentrate on photography even when shooting such subjects as stage performances. The PENTAX K-01 features a large, easy-to-view, high-resolution 3.0 inch color LCD monitor with approximately 921,000 dots. The wide-view design assures a clear view of the monitor from approximately 170 degrees horizontally and vertically, which is useful in low- and high-angle shooting. 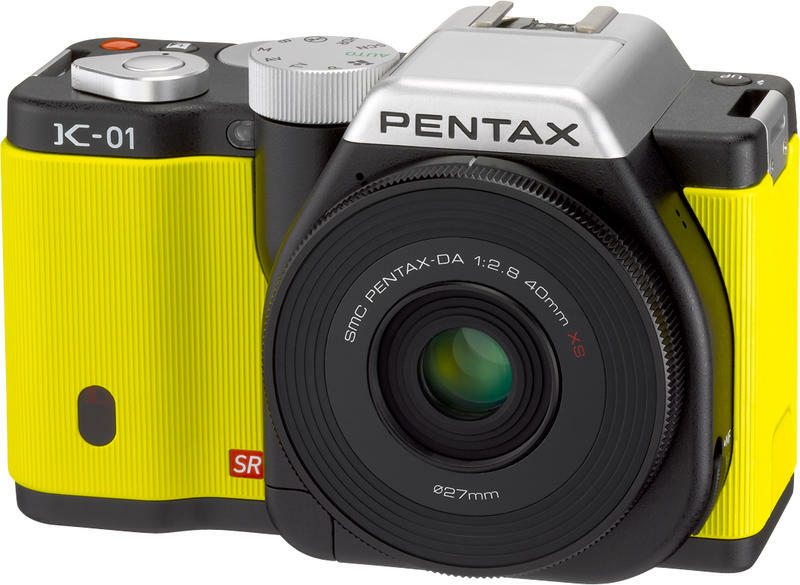 The PENTAX K-01 incorporates the PENTAX-developed SR mechanism, which effectively reduces annoying camera shake by approximately four shutter steps. Usable with all compatible lenses, including those produced for film-format SLR cameras, this mechanism produces sharp, blur-free images even under demanding conditions that are prone to camera shake, such as when using a telephoto lens, shooting in the dark without flash illumination, or capturing landscapes in the twilight. 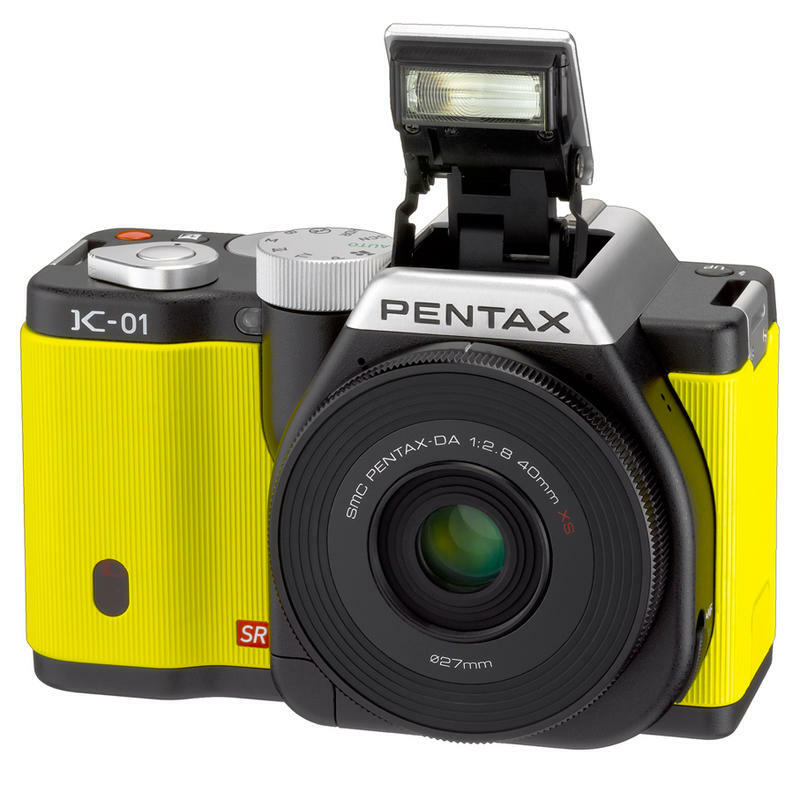 Equipped with the PENTAX O-GPS1 device (an optional GPS unit launched in June 2011), the K-01’s SR system helps astrophotographers track and shoot celestial bodies. The PENTAX K-01 features the PENTAX-original, user-friendly Auto Picture mode, which selects the most appropriate shooting mode for a given subject or scene from Portrait, Landscape, Macro and other distinctive shooting modes, while optimizing all camera settings, such as aperture, shutter speed, white balance, saturation, contrast and sharpness. This allows a new photographer to concentrate on image composition and shutter opportunity. The K-01 also offers 19 different Scene modes to help simplify the photography of challenging subjects or scenes such as Night Scene Portrait mode, Pet mode, and Backlight Silhouette mode. Users simply choose a corresponding icon on the camera’s LCD monitor. The exterior of this ultra-slim new lens was designed by Marc Newson to complement the clean, contemporary design of the K-01 body. This unifocal standard lens offers a focal length equivalent to 61mm in the 35mm format and measures a mere 9.2 millimeters thin (only 0.36 inches) making it the world’s thinnest interchangeable lens. The ultra-thin design is highly portable and easy to store and carry. Designed with the acclaimed smc PENTAX-DA 40mm F2.8 Limited lens in mind, the maximum aperture of the new lens is F2.8 to produce sharp, bright images in a wide range of applications, including snapshots, scenic photos, portraits, and even incident-light indoor shooting. PENTAX conducted numerous image-quality tests of hundreds of images taken with this lens. Upon assessment, the lens offers outstanding optical clarity and subject reproduction characteristics. Rounded diaphragm blades produce a smooth, natural bokeh (out-of-focus) background effect. The front surface of this lens is treated with SP (Super Protect) coating, an exclusive fluorine compound applied to the surface through a vapor deposition process. This SP coating not only repels dust, water and grease, but also makes it easy to wipe off stubborn stains such as fingerprints and cosmetics. Newson has lived and worked in Tokyo, Paris, and London where he is now based, and he continues to travel widely. His clients include a broad range of the best known and most prestigious brands in the world – from manufacturing and technology to transportation, fashion and the luxury goods sector. Many of his designs have been a runaway success for his clients and have achieved the status of modern design icons. In addition to his core business, he has also founded and run a number of successful companies, including a fine watch brand and an aerospace design consultancy, and has also held senior management positions at client companies; including currently being the Creative Director of Qantas Airways. Marc Newson was included in Time magazine’s 100 Most Influential People in the World, has received numerous awards and distinctions; he was appointed The Royal Designer for Industry in the UK, awarded an honorary doctorate from Sydney University, and holds Adjunct Professorships at Sydney College of the Arts and Hong Kong Polytechnic University.